I’ve been to big conferences before; in a previous career field, the biggies had 30,000+ attendees packing the halls of giant convention centers in Orlando, Chicago, Dallas, etc. Heading to my first Dreamforce, I thought I had a pretty good understanding of what to expect. After registration, I headed back to the hotel with a new laptop backpack full of swag. It was a good first impression, but my expectations remained tempered, knowing from experience that conferences sometimes go big on flashy content, but are short on substance. I was ready for Dreamforce, but not about to be drawn in by hype alone. 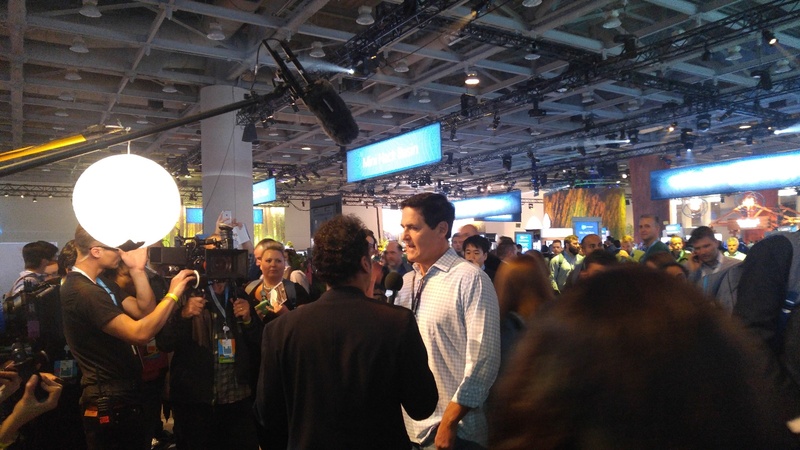 And I definitely wasn’t going to catch a full-blown case of Dreamforce fever. My first Dreamforce began at the State of the User Groups Address for Salesforce User Group Leaders. As I turned down a hall for the meeting, I heard a deep bass line and the loud conversations of 150 people. It was only 8am, but the scene I walk into feels more like a nightclub than a conference. The session itself was interrupted by enthusiastic cheering, clapping and shoutouts, followed by a bag full of swag (this will become a theme). I’m generally not a trinket person, but an hour into Dreamforce, I already had a Salesforce umbrella, selfie stick, backpack, water bottles, shirts and more—a collection of stuff beyond what I’m normally willing to pack. I grabbed a pour-over coffee at the free cafe, and wandered into the Trailhead Zone, an area that included the Trailhead Visitor Center, Developer Forest, Admin Meadow, CIO Lodge and Startup Valley (Dreamforce had a wilderness theme this year). I was immediately overwhelmed by the crowds and noise. Salesforce gear was everywhere, and on almost everyone. 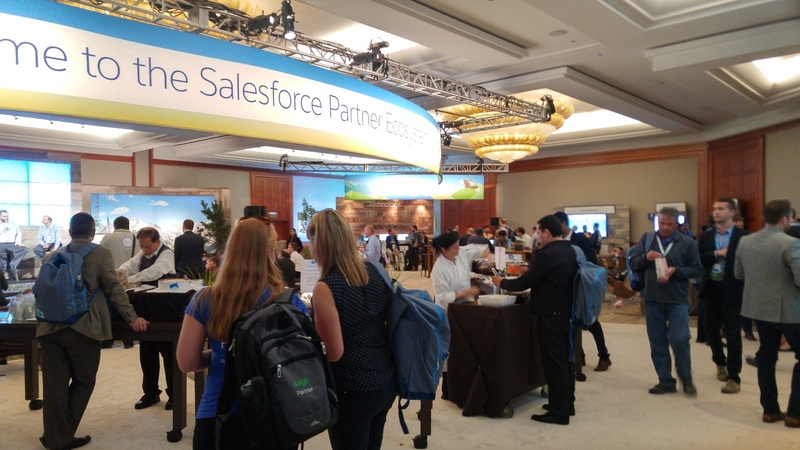 There were Salesforce shirts, hats, shoes, socks, pins, badges (you could earn them by engaging in different activities) and even stuffed animals. When I was a college student, I sold Cutco knives. The seminars were kind of cultish, and my manager would dress in costumes (like William Wallace) to motivate the team. I remember being put off by the strange excitement they tried to drive around selling cutlery. Taking in the scene at the Trailhead Zone, I was having some similar skeptical feelings. The thing is, the sessions were fantastic. I attended several great ones, including the Usability Ninja’s Tips & Tricks course, and the Awesome People Party for MVP’s and User Group Leaders. As I wrapped up a productive day with yet another free bag full of Salesforce swag in tow (hats, a device charger, more shirts), I suddenly feel my resolve start to break… I eat dinner alone to escape. Simplus’ Orion Wolfe & I sling syrup in San Fran during our Summa days. 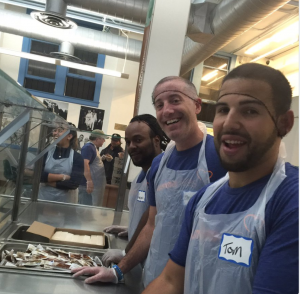 My group started our day serving 500+ breakfast meals for the homeless and needy of San Francisco at a local non-profit called GLIDE. As we left the amazing event, I quickly set off to my first session. “I’ll just skip breakfast so I arrive on time,” I thought. Yup, I was coming down with something. In between sessions, I would excitedly recount what I had learned with the other members of the Summa team, espousing the awesome things coming for Lightning Experience, Non-Profit Success Pack (NPSP) and Communities. 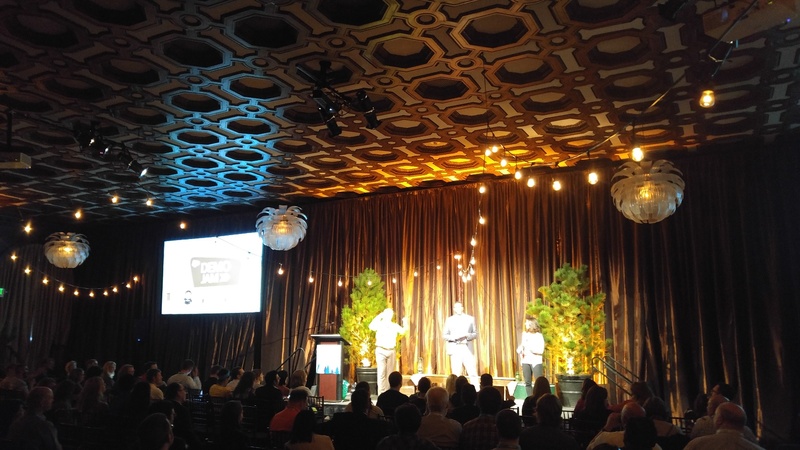 The keynote from Salesforce founder and CEO Marc Benioff was unlike anything I’ve seen—it was punctuated by visit from Will.I.Am, Hawaiian folk singers, an Einstein hologram and plenty of hijinx. The Benioff keynote simultaneously wove together the themes of technological advancements with being part of the Salesforce family, one whose core mission was to first be good stewards of our communities. Oh, and then I bumped into Mark Cuban. At this point, I admit, I was in deep. I was quickly transforming into a Salesforce evangelist. I set out in my new Trailhead hoodie and SF Camp App t-shirt for another day of classes. I got help on a project at the Code Consultation booth in the Developer Forest (saving me hours of frustration! ), attended the Commerce Cloud keynote, Lightning Bolt introduction and other presentations. I learned a ton and am eager to apply my new knowledge when I get home. Originally, I planned to skip the Expo Hall, fearing an endless sea of sales pitches. But Dreamforce fever overrides all hesitations, and I soon found myself engaging with representatives about apps and products I would love to have in my consultant toolbox. What’s more, this anti-trinket guy finally gave in to the pursuit of swag. I won Beats by Dre earbuds at the Partner Lounge! And who passes up a stuffed Groot doll? Suddenly, I was in need of a bigger suitcase. On the final day of Dreamforce, I checked out of my hotel room with three new bags to complement the one I brought on the trip out. I filled my morning with informative sessions and a final trip to the Trailhead Forest to complete some Mini-Hacks and Design Challenges, and to listen in on Awesome Admin presentations—learning and honing skills that will be valuable in my Summa projects. Afterwards, I walked over to Dreampark. I had lunch sitting in a bean bag while bands played on two stages. I took a final spin through the Expo and Trailhead Village and grabbed a final free espresso at the cafe. How disappointing that this experience ended so quickly. Yes, it’s crowded, loud, strange and intense, but I can say without hesitation, Dreamforce was the best professional development experience I’ve had at a conference. I came away from Dreamforce with a new passion for Salesforce, deeper knowledge, many new skills, enough new Salesforce clothing to last me a week without doing laundry and a certainty that joining Summa as a Salesforce Consultant has and will continue to be a transformational experience in my life. I left San Francisco amazed how big the Salesforce family is. I’m awed by how people around the world are using the platform to tackle challenges from meaningful customer engagement to ending the AIDS virus, and I’m proud to be a part of it all. The weekend after Dreamforce, clad in my new Salesforce trucker hat, I gave a live-streamed presentation at Pittsburgh’s GiveCamp (a hackathon to support local charities—watch a video of our final presentations here! ), where attendees referred to me as “Salesforce Tom”. I decided to wear the nickname with pride. 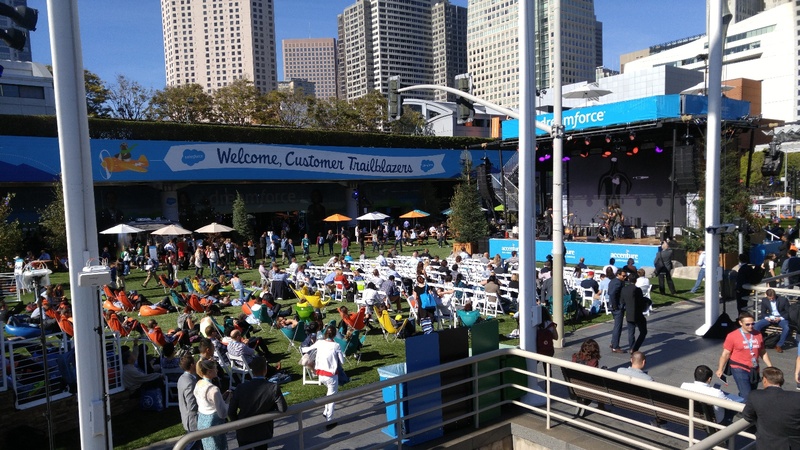 As I write this from notes in my leather-bound Tact (a Salesforce app) notebook and drinking from my FinancialForce water bottle, it seems that once bitten, there is no cure for the Dreamforce bug.